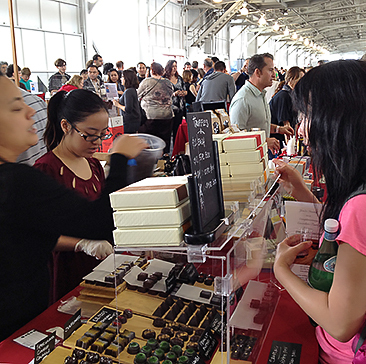 The 2018 International Chocolate Salon was a noisy, bustling scene at the San Francisco County Fair Building in SF’s Golden Gate Park, March 11. A scene that signified to me that artisan chocolate in SFBA is a real community. The Salon has been an annual event for over 10 years now, a lot of the vendors are local and repeat exhibitors, and there is a real camaraderie among the chocolatiers themselves, the public, and the event staff. This year, local chocolatiers ranged from a new-to-the-Salon Swiss-trained chocolatier from Half Moon Bay to the woman who started the artisan chocolate scene here back in the 1970’s. Alice Medrich brought the recipe for chocolate truffles to SFBA from Paris in 1973. She made such an impression locally that she opened her own shop, Cocolat, in 1976. She was a successful pioneer in American artisan chocolate, proving its viability. She no longer sells chocolate, instead focusing on writing cookbooks, teaching classes, giving talks, and doing demonstrations. 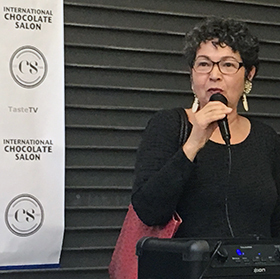 She was at the Salon discussing and signing her latest books, plus receiving an award as one of the leading SF Women in Chocolate. Other chocolatiers were able to create successful businesses here too due to her trailblazing, such as Joseph Schmidt, who in turn influenced today’s generation of chocolatiers, like Basel Bazlamit of Basel B Inc., who credits Joseph Schmidt as his mentor. We first met Basel 4 Salons ago when he blew us away with his ornately sculpted giant truffles. At this salon, he had his range of 85% dark truffles that look like brooches packed individually in black boxes that reinforce their jewelry look. In addition to the serious eye-candy truffles, he had square mini-truffles of the same flavors (which I prefer because I like the ratio of filling to shell more), plus holiday-themed chocolates. He had molded dogs filled with a “less sweet” matcha green tea & black sesame seed ganache for Chinese New Year. He also had Valentine hearts filled with black cherry ganache & roses flavored with lavender (huh?). And for Easter, he had big truffle bunnies. Almost everything was gluten- and dairy-free. And 7 of his truffle flavors are vegan. The bunnies came in 3 flavors — matcha green tea/sesame, black cherry, and peanut butter — and 2 surface textures —glossy and furry. The furry bunnies were certainly unique. Basel told us he used white chocolate to create the “velvet look” of the bunnies. As someone who is drawn to clothes that just need ping pong ball eyes added to look like a Muppet, I had to buy a fluffy bunny. And if you know anything about my tastes, you know I got a peanut butter one. Like his big, ornate truffles, the bunny is too big to eat in one bite. And like the rest of the Basel B line, the bunny had a hard 85% shell, which shattered when I cut it open, so it’s not really a piece you can nibble away at over time like a traditional Easter bunny. It’s big enough to share, which is what we did, and that worked out just fine. While the shell was hard, the peanut butter ganache inside was super soft. It had a subtle peanut flavor, which was nice, but I would have preferred a denser, more peanut-buttery ganache. New to the show were Basel B’s chocolate dipped orange twigs, which he candied himself using fresh organic oranges. They got good marks from us CBTB-ers with their soft chewy peels that balanced the chocolate with a strong, not bitter orange flavor. The twigs also come in lemon. Basel B Inc received 1 Gold and 2 Bronze Judges Awards at the Salon. Absence makes the heart grow fonder, and there were a few people noticeably missing this year. Flying noir was a no-show, which was sad because Karen Urbanek wowed us with her Out-of-Country collection last year, and we were anticipating something equally cool at this Salon. And when we arrived at CocoTutti’s booth, there was no Elyce! 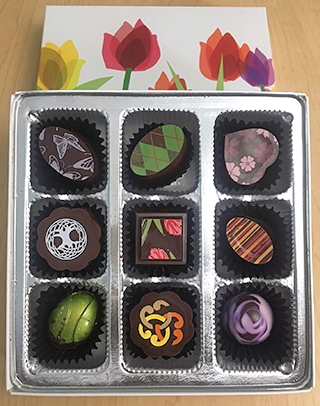 We always look forward to catching up with CocoTutti ’s founder and master chocolatier, but she was away at the 2-day Oregon Chocolate Festival in Ashland, OR, along with a couple of our other favorite Salon vendors. Her husband and the rest of her team were very efficiently doling out a greatest hits collection: Whiskey, Raspberry, Ginger Caramel & Spicy Chili Peanut, Orange Florentine, and Strawberry. While we missed Elyce, her business didn’t seem to suffer in her absence. CocoTutti was very popular; it seemed like they were having to constantly restock the sample plates. It’s nice to know her chocolate is so wonderful, it sells itself; but I hope next year the festivals don’t land on the same weekend, so we can find out what Elyce has been doing in the interim. CocoTutti is available online, at special events like the Salon, and at select stores. Check their website for locations and events. 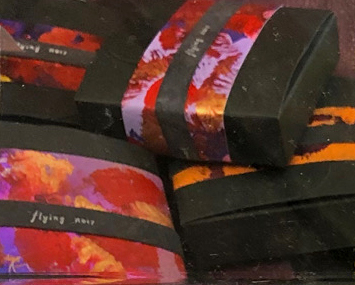 Flying noir chocolates are also available online and at special events. Check their website for details. CocoTutti received 2 Golds, 2 Silvers, and 4 Bronze Judges Awards at the Salon, plus 2 Bronze in the People’s Choice Awards. 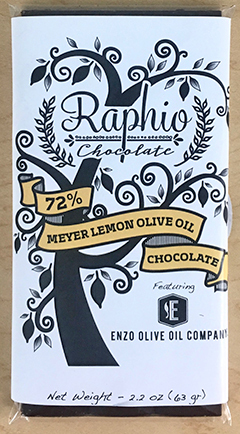 Fresno-based Raphio Chocolate stretches my definition of local, but they are worth it. And since they have made several appearances at the Chocolate Salons, they are definitely part of the community. We loved this bar and shared it with a lot of people. It was popular, but a bit polarizing too — people who didn’t like it really didn’t like it and thought it left a bitter aftertaste. People who loved it, liked the slippery texture from the olive oil and the lingering lemon end-note. If you don’t like citrus/chocolate combos, steer clear of this one. If you do like a good orange chocolate, give this twist a try. Meyer lemons are sweeter than other lemons, so it really isn’t bitter, and olive oil chocolates are just fun to experience. I don’t even know what the crunchy bits are: Cacao nibs? Toffee? Really coarse coffee grounds? But I loved this bar. The tastes and textures go together well. If you know a coffee and chocolate lover, this would make an excellent gift. Raphio Chocolate recently opened a store in Fresno, but if that’s too far to trek, Chocolate Covered carries their bars, as do some other local stores (check their website for locations). Or order online. 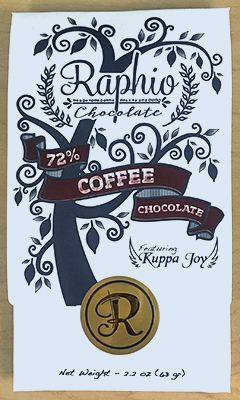 Raphio Chocolates received 2 Silvers and a Bronze Judges Awards at the Salon, plus a Gold, 3 Silvers, and 4 Bronze in the People’s Choice Awards. After being thoroughly wowed at the last Salon by this new chocolatier, we practically skipped over to Michael’s Chocolates’ booth to see what amazing-ness awaited. We were not disappointed. 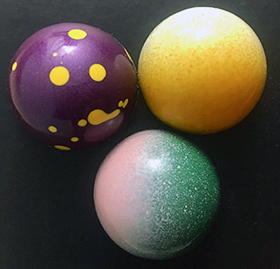 Curtis Wallis, Michael Benner’s husband and business partner, showed us the box of their early spring seasonal bonbons, which included the award-winning Lemon Burst and 2 new bonbons. The first one we tried, Chai, was a gorgeous deep purple splotched with bright yellow drips. It’s a 61% dark shell surrounding a ganache flavored with chai from local tea merchant, Samovar. It’s a very tasty blend, with different notes of ginger, cinnamon, clove, and pepper popping up as it melts in your mouth. It made me think all chai should have chocolate in it. The piece was so new, it debuted at the Salon. Anamika hadn’t even seen it yet, but Curtis assured us that after this salon, they would be taking her the new truffle. I hope she enjoyed it as much as we did. The other new piece, a half-green/half-pink dome sounded intriguing: Pistachio Cardamom. It’s another delicious bonbon with a bit of crunch and a hint of citrus and an end note of cardamom. Curtis said the reaction to this one has been amazing. And I heard someone say, “I might like this better than the lemon,” which is high praise if you’ve tried the Lemon Burst. Curtis told us they have been busy since we saw them in the fall with special events and truffle-making classes, in addition to making chocolates. They do the truffle-making class at Olive This, Olive That, in Noe Valley. It’s a regular event, tied to the holidays, at which you make 6 truffles to take home. Check their website for more info. The experience set him on a new path. “Now I’ve switched to natural pigments using marigolds,” which presents new challenges: “Everything turns yellow gold when I spray it,” not just the chocolate he intended to color. 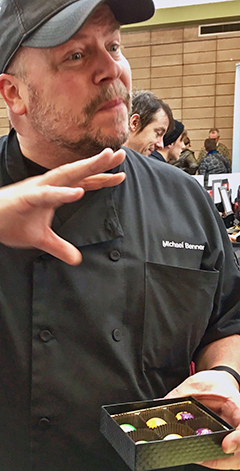 Things have been busy for Michael’s Chocolates since last fall’s Salon with production ramping up and new retail partners in SFBA. Michael also told us something surprising: They offer free delivery in SFBA. Michael’s Chocolates are available in some local shops in SFBA. Check their website for locations. And check their events page for chances to meet the maker as well as buy the bonbons. Michael’s Chocolates received 4 Golds, 1 Silver and 2 Bronze Judges Awards at the Salon, plus 4 Golds, 2 Silvers, and 2 Bronze in the People’s Choice Awards. Tombo Toffee, another recent, but regular Salon vendor, has settled on a system, it seems, for these events. 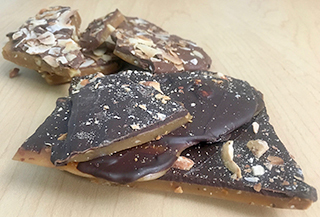 Three flavors of toffee in 2 sizes keeps it simple for sampling and deciding what to buy. I’m sure it makes it easier on the production side too. This time it was Orange, Cayenne, and Bourbon toffees. We’d tried the first 2 previously, but hadn’t seen the Bourbon before. Lisa Grantham, Tombo’s founder and candy maker, told us that the Bourbon isn’t new but it’s been getting more popular, so she decided to bring it to the Salon for the first time. This marinade technique makes for a non-boozy flavor. The toffee has a good chocolate smell and a nice burn on the tongue, with just a subtle buzz. It doesn’t scream bourbon, it’s well balanced. All of us CBTB-ers loved it. Lisa told us she has recently started selling a select line of her toffees in Market Hall, in addition to other local markets. 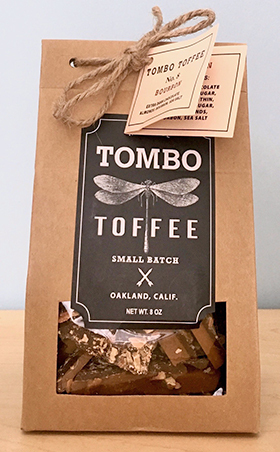 For the larger Tombo Toffee selection and other locations, visit their website. Tombo Toffee received a Gold Judges Award at the Salon, plus a Silver People’s Choice Award. When we stopped by Fera’wyn’s Artisan Chocolates this time, we noticed Joanna Whittingham was not in the booth. 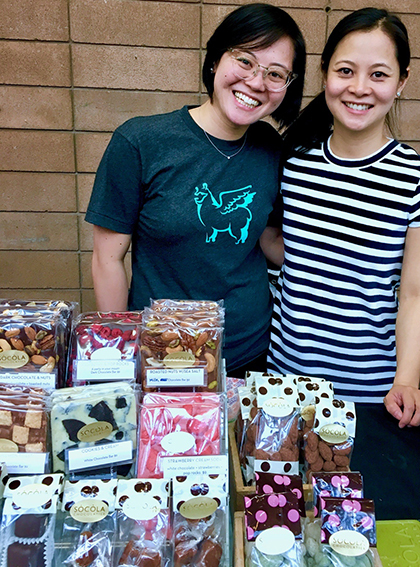 Her husband and fellow chocolatier, David, told us she had gone to the Chocolate Festival in Ashland with Elyce (CocoTutti) and Sam (Cowboy Toffee Co.), while the husbands were manning the booths at the SF Chocolate Salon. “The little chocolate community,” he said, giving me a title for this article. Thx, David. My usual “What’s new?” opening got a typical answer at first. David told us they have a Rocky Road candy, in both dark and milk chocolates. We tried it and found that it is not your typical Rocky Road: In addition to the expected marshmallows, chocolate and nuts, there were also freeze-dried raspberries and some kind of jellied fruit. It’s fun, with unexpected flavors and textures, but the dark chocolate was too hard. I’d recommend the milk chocolate version. I am a coffee drinker, but I liked it too. It’s smooth: coffee flavored enough while not overly buzzy from the whiskey. It’s popular too: David told us it had just won Best Bonbon in Ashland that same day. “The Bay Area is really busy and expensive. It took me a minimum 3 hours driving to work and back — and that’s starting at 6am. Now my commute is 10 seconds. I get up, walk upstairs, and work remotely. “We like the small town feel [of where we moved]. We plan to open a shop. We want to buy an older home and convert it — like a tea house: live upstairs, make chocolate in the back. “Holly Springs [near the Research Triangle in NC] has an area where we want to buy — convincing someone to sell, that’s the problem. Nobody wants to leave. The SFBA’s high cost of living has squeezed another chocolatier out. I hope North Carolina welcomes Joanna & David with the enthusiasm we have always felt for them and their wonderful chocolate. We are sorry to see them leave, but we hope they do keep coming back and sharing their chocolate and adventures with us. Fera’wyn’s Artisan Chocolates are available online and at special events. Check their website and FB page for the latest info. Fera’wyn’s Artisan Chocolates received 2 Silvers and 3 Bronze Judges Awards at the Salon, plus a Silver People’s Choice Award. After that bit of sad news, we needed something to cheer us up. Luckily, we were in the middle of a sea of chocolate at the Salon, so we didn’t have to search far: We were cheered up at the next booth we visited by Brian Wallace and his Endorfin Foods. Brian told us that they have new cacao sources in Columbia and Ecuador, which he said better match with Endorfin’s flavored chocolates. I tasted the new Columbian bar, Coconut Dream, and I think Brian is right. This is the best Endorphin bar yet — it’s the closest to what I expect a chocolate bar to taste like. Endorfin chocolate is unroasted, so it’s always going to taste different from traditional chocolate. 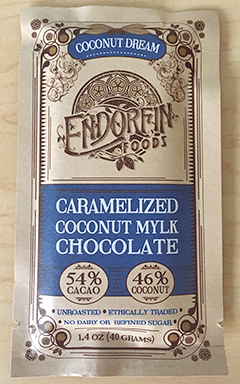 Different isn’t bad, and by minimally processing the cacao, Endorfin is preserving more of its health benefits. But I prefer the deeper flavor roasting gives chocolate and the harder snap a traditional bar has, so I’m not going to choose the “healthy” bar first with its more raw taste and soft-yet-grainy texture. The caramelizing makes the bar sweeter, which I think makes the bar taste more traditional. The caramelizing also disguises the coconut origin. If you didn’t know it had coconut in it, you probably couldn’t tell it was coconut. 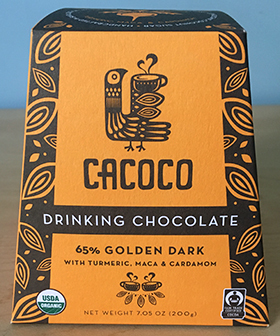 The new cacao is better too. It’s extra tangy, and tastes like a dark chocolate, but it’s not bitter. It’s turned out just fine. 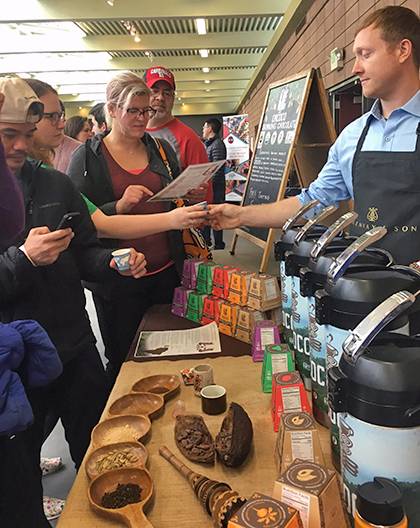 “They are selling a lot of chocolate, and we are doing a lot of tastings there,” Brian explained. In addition to Berkley Bowl West, you can purchase Endorfin bars at other locations across the country. Check their website for current locations. You can also ppurchase Endorfin chocolate online, including monthly subscriptions, which include limited edition chocolates you can’t buy otherwise. Endorfin Foods received 2 Silvers and 2 Bronze Judges Awards at the Salon, plus a Silver and 3 Bronze in the People’s Choice Awards. Another husband handling chocolate-selling duties solo at the Salon was Dan McGinnis of Cowboy Toffee Company. If you know Dan at all, you know he’s pretty witty, so this made for plenty of jokes riffing on the lonesome cowboy/Lone Ranger line. Even though he was pretty funny, we still missed Samantha, who was in Ashland with the other wives for the competing Chocolate Festival It seemed especially disappointing because the new flavor Cowboy Toffee introduced at the Salon is called “Missus Boss,” which Dan told us was made to celebrate the Women in Chocolate awards at the Salon, and was a toffee that’s all Sam. Agreed, the blue petals didn’t add their own flavor, but they did show taste: They were very pretty strewn across the white chocolate layer. I know I always say I don’t like white chocolate, and lately it seems like it’s always in the context of something I like that includes white chocolate. Same case here. Missus Boss is a very tasty toffee. The Lady Grey tea (with an extra shot of bergamot oil) gives it a subtle citrus flavor that pairs well with the strong Tahitian vanilla. The white chocolate and the toffee add a buttery flavor, there’s nothing extraneous here and it’s all just enough. One more thing: The toffee texture was unique. Not hard, not chewy, not soft; I guess I would call it crystal-y, kind of like spun sugar was added in. As toffee has become a bigger part of the Salon each time, it’s interesting how everybody seems to have a different take on how long to cook sugar/butter combo. 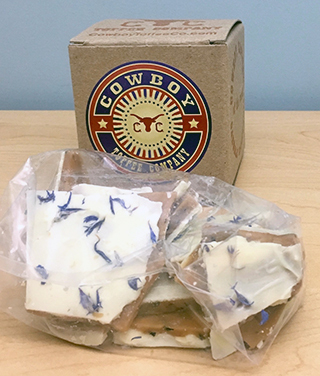 Cowboy Toffee is available online and at special events. Check their website and FB page for more info. Cowboy Toffee Company received 2 Silver Judges Awards at the Salon, plus 2 Gold and a Silver People’s Choice Awards. When we visited Rainy Day Chocolate, Jennifer had laryngitis, so her husband, Chris, was making his first appearance at a Salon and doing most of the talking. He told us that April would mark one year of marriage, and they’d been working together in chocolate for 3 years. More proof that chocolate builds community, and did you notice how many of these local businesses are husband-and-wife ventures? Along with their truffles and bars (I recommend the award-winning 69% Dark Belgian + Cacao Nibs Bar), they debuted 2 toffees at the Salon, which Chris seemed as proud of as their marriage. One was a pretty traditional English toffee. The other a milk chocolate toffee with what seemed at first minor ingredient changes, but a totally different experience. We tried the Milk Chocolate Macadamia Nut & Toasted Coconut Toffee first and loved it. Rainy Day toffees are chewy — I like how everyone doing toffee seems to have their own texture. I know a lot of people worry about chewy toffees vs. their dental work, but this toffee is satisfyingly chewy, so if you’re brave, this one is worth a try. The Dark Chocolate & Salted Almonds was more classic, but smokey and chewy. I liked it, but not as much as the milk chocolate toffee. Rainy Day Chocolate received a Silver and 2 Bronze Judges Awards at the Salon, plus a Bronze People’s Choice Award. I don’t drink a lot of hot chocolate. Traditional European style chocolate drinks are so rich that they are a definite once-in-a-while treat for me. But Cacoco has been slowly changing my drinking habits. It started with their Firewalker drinking chocolate, which has a mild burn that soothes my throat when I have a cough. It’s one of my go-to treatments now when I have a cold. And after this latest Salon, I have another favorite. It’s not new, but I’m wondering if it’s been tweaked because I didn’t care for it before, but this time I practically craved it. The 65% Golden Dark, AKA Global Warrior, has an herbal/spice blend of tumeric, maca, and cardamom. To me, maca usually tastes too earthy and ruins the taste of good chocolate. But it’s supposed to be good for improving your energy and endurance, so maybe this is a case of food as medicine and I need an energy boost, so suddenly I like it. Whatever the case, I now pronounce Golden Dark as good. The blend tricks my mouth to say it tastes vaguely minty — because what part of tumeric, maca, and cardamom tastes like mint? But I stand by that description now. It also ends with a distinctly cardamom aftertaste, which I enjoy. Another nice drinking chocolate to try, is the new one Cacoco’s Rob Blume was sampling at the Salon: 75% Mint Dark Chocolate. This is not your traditional mint chocolate; instead it’s flavored with spearmint essential oils. I’m not sure I’ve had spearmint in chocolate before, and it was a bit of a shock. This is a dark chocolate, but the spearmint is strong. Rob recommended putting your own fresh mint on top and serving it cold, which sounds like a nice summer drink. I’m looking forward to trying it that way when temperatures are higher than the drink’s cacao percentage. You can order Cacoco products online or find them locally in grocery & specialty food stores, like Farm Fresh to You, Rainbow Grocery and Real Food Company. Check their website for locations — including some across the country. Cacoco received a Silver and a Bronze Judges Awards at the Salon, plus 2 Bronze People’s Choice Awards. We always like to stop by the booth of Salon veteran and local candymaker, Kindred Cooks Caramels, to catch up with its founder, Jeri Vasquez, and try something new and non-chocolate. Let’s call it a palate refresher. 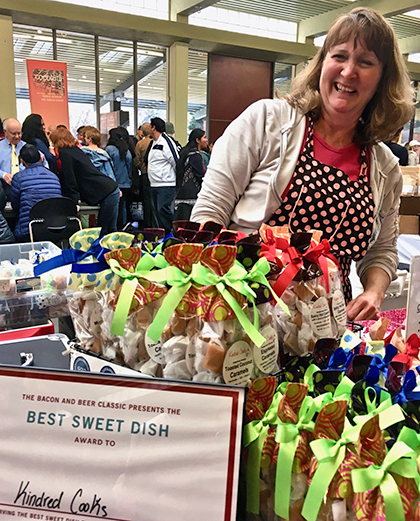 Jeri told us they had just won a top award again at the Bacon & Beer Classic for their Spicy Bacon Caramels, which is pretty special when you think of how many treats are bacon flavored these days. Of course, if you’ve tried these caramels yourself, you know it’s well deserved. This new one succeeds in that respect, and also in being a wonderful addition to her line. It’s a bright, smooth, lemon-y caramel with lemon taste building as the caramel dissolves in your mouth. It’s also not particularly floral tasting, which would be a turn-off to me. Instead the lavender is very quiet, slightly tempering the lemon, but not pronounced tasting in any way. We love it. Kindred Cooks Caramels received a Gold and a Bronze Judges Awards at the Salon, plus a Bronze People’s Choice Award. 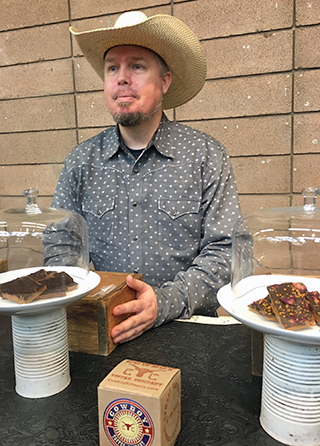 Second-time Salon vendor, fudge-maker Z. Cioccolato had some new flavors to sample, which gave us a chance to talk with owner Mike Zwiefelhofer and get to know him and his business a little better. Z. Cioccolato’s fudge comes in a wide variety of flavors. If you need help choosing, I recommend looking for the ones featuring peanuts. Last time we were introduced to the elaborate 7-layer peanut butter pie fudge. This time, he had some cheesecake flavors and a childhood throwback he wanted us to try. Mike uses a vanilla fudge as the base for the cheesecake fudges. The Raspberry Cheesecake Fudge had a strong raspberry flavor but zero chocolate, so it’s a no for me. I prefer chocolate in my fudge. Caramel Pecan Cheesecake Fudge had some added chocolate, but not enough to sway me. Mike told us he’s always thinking of new creative flavors and likes to challenge ideas of what fudge can be. I like that attitude; it can make for some happy discoveries, like the Snickers fudge that was the other new flavor he had at the Salon. He plans on keeping the store, even though they also sell online, because of the shopping experience. Z. Cioccolato is 15 years old with a storefront in an expensive part of town. Mike bought it 3 years ago and thinks the timing was right. “People are leaning toward experiences, instead of just buying things, which is what we try to do ourselves. We provide lots of sampling and make sure it smells good in the store. 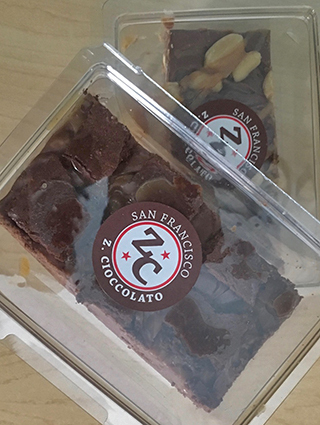 You can buy Z. Cioccolato fudge at their store (474 Columbus Ave, SF), online, and at special events. Check their FB page to see where they will be next. Z. Cioccolato received a Silver and 2 Bronze Judges Awards at the Salon, plus a Bronze People’s Choice Award. At the Socola Chocolatier booth, we spotted a familiar face that’s been MIA for a few years: Wendy Lieu’s sister and Socola co-founder, Susan, was at the Salon! She told us she lives in Seattle now, working as a senior management consultant and a performance artist doing stand-up. If you know anything about her, you know this makes perfect sense. In addition to the surprise of Susan manning the booth again, Socola also had a new flavor: dehydrated blood orange with lapsang souchong tea, but that’s a smoky tea that I don’t like, so I passed. Wendy Lieu told us about the new Walter White chocolate (wait, what?!) and how the flavor came about. When they did a Kickstarter campaign for their store, a backer donated a certain amount to get a chocolate made especially for himself. He picked blood orange and white pepper — and his name is Walter White (so not that Walter White). Hence, the new Walter White flavor that debuted at the Salon. You can try it for yourself, but it’s available at their store only. Socola Matcha Almond Dragees: maybe better than the crunchy matcha bar? Socola had their full line of chocolates at the Salon: truffles, bars, confections, and some non-chocolate things too. Wendy said they were still offering 5 bars for $40, which is a good value, and you pick the bars you want (unless they’ve run out of the Matcha Green Tea bar, grrr…). But this time around we decided to explore their confections, and OMG, what a find. We tried 3: Blind Dates, Salty Chewy Caramels, and Matcha Almond Dragees. We loved them all. The first reason we like these so much: They are not overly sweet. I tend to avoid confections because they are usually too sweet for me. I’d rather stick to dark chocolate than risk getting nauseous from too much sugar. But I trust Wendy’s recommendations — and her restraint in sweetening her recipes. Another thing about Socola I like is that they often use more unusual ingredients and get it right. For example. the Blind Dates are chocolate-covered Medjool dates stuffed with almonds. Each not-too-sweet piece is a big, soft date with a crunchy nut inside, covered with dark chocolate. Really nice. After trying these, I’m surprised that not every local chocolatier is making something like this: the dates and almonds are both California grown, and the combination with dark chocolate is delicious. You will have to come up with your own name though; Socola has already nailed it with the best funny name. Finally, these confections come in a simple-but-attractive, just-right gifty-sized package. Although in the case of the Matcha Almond Dragees, which we all found addictive with the pronounced matcha flavor and crunchy almond, the only problem we had is that the bag is too small. Our advice: Buy 2. 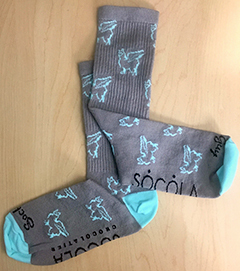 I also have to mention Socola’s super-cute merchandise. I love wearing my Socola T-shirt, and it does get people asking (or telling) me about Socola. It seems to me that all the vendors with attractive logos (I’m looking at you especially, Tombo Toffee) should consider this way of marketing and building brand loyalty. Yes, I do reuse the branded paper bags I get, but a cloth bag would last longer and look nicer. Socola’s chocolates and candies are available online, but for the full line including pastries, coffee and hot chocolate drinks, visit Socola Chocolatier + Barista on Folsom in SF. It’s also where you can pick up non-edible Socola items, like their cute T-shirts, socks, and jewelry. Socola received 2 Silver Judges Awards at the Salon, plus a Gold and 3 Bronze in the People’s Choice Awards. The last booth we visited was new-to-the-Salon, Sweet55. 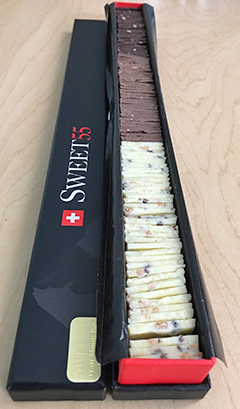 We first encountered Sweet55 chocolates in a caramels competition last year and loved their entry. So we were excited to see that they would be at the Salon and looked forward to meeting their maker and trying more of their offerings. 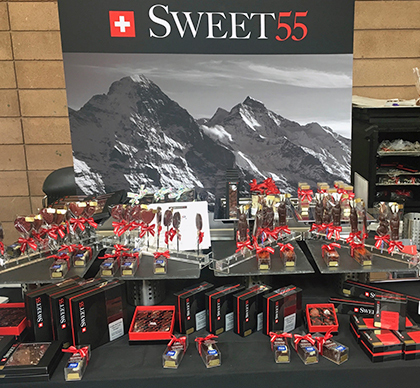 Their booth was definitely eye catching with a big bold banner of their logo and the Swiss Alps, plus a large display of an impressive variety of chocolates in their distinctive black, white and red packaging. I wanted to try everything just on looks alone. They were sampling a couple of truffles: a coffee pecan caramel, which had a smooth caramel ganache with a crunchy pecan layer on the bottom, very nice; and a single-origin Ecuador 72% dark chocolate, which was equally nice. I was sold, and there was still a whole booth of treats to check out and the chocolatier to meet. Sounds like a good excuse for a road trip. 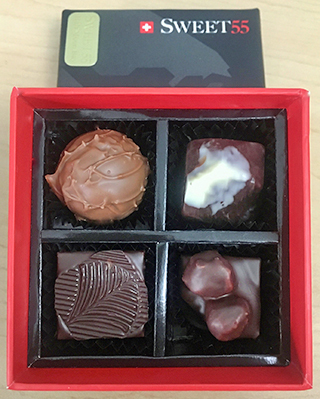 Sealing the deal is that while you can buy their chocolates online, you can’t choose what’s in the box. At the store, you can make your own box. After having tried a range of Sweet55 chocolates, I can say that personally, I don’t care which ones are in the box; I liked/loved everything I tried. She has a whole range of single origin truffles. They all have nice dense ganaches and distinct flavors. I liked the 74% Dominican best with its very raisin-y ganache. Her flavored ganaches are just as nice. They are mostly what I’d call traditional European flavors, such as a crunchy hazelnut praline; a fruity Earl Grey praline that had that distinctive bergamot scent and aftertaste; whole hazelnuts in dark chocolate there were just yummy; and a gianduja & orange in a cute mountain mold, that in addition to the expected orange and Nutella flavors also had nice crunch. Sweet55 also has some more American-sounding flavors, such as a milk chocolate ganache with vanilla & sea salt; and the California Republic, an Olive Oil truffle with Meyer Lemon and Rosemary that has a bright citrusy flavor and smooth texture from the oil, which Ursula told us used all California-sourced ingredients. Sweet55 truffle are uniformly good with dense ganaches in shells that are the perfect thickness. They are a real treat. 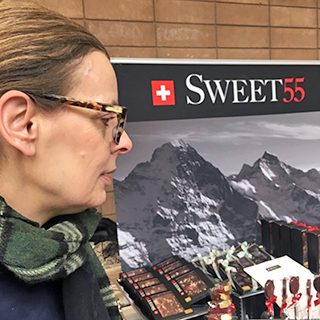 But Sweet55 also have fruit patés (at the Salon they were blood orange, blackberry, raspberry, and pear), chocolate lollipops, mendiants, bars, and other treats, including an intriguing item in a stand-out box: Mini wafers with cacao nibs. I agree, I’ve never seen this type of packaging for chocolate before. It makes you so curious as to what’s inside. Which in this case are these densely packed square wafers of chocolate. The thin, little wafers (about 1″ square) are a nice treat — just a small shot of chocolate each, a variety of chocolate strengths, and lots to share. I found myself liking the white chocolate wafers because the nibs help cut the sweetness of the white chocolate. And the box makes a nice presentation. Considering the reception Sweet55 got at the Salon, she has reason to be confident. She said it’s been a “completely overwhelming response,” and she was selling out of items fast. She also racked up some solid recognition: Sweet55 received 2 Gold, 2 Silvers and a Bronze Judges Awards at the Salon, plus 2 Gold and a Silver in the People’s Choice Awards. You can buy Sweet55 online, but a weekend road trip to Half Moon Bay to visit the store for pastries and coffee — and the ability to choose your chocolates — sounds like the best way to go. It was good to see that San Jose-based R & J Toffees returned to the Salon with their classic English toffee. Nothing new to show, but their toffee is still at the top of its form and a good choice if you are looking for traditional toffee. You can buy R&J Toffees online, at SFBA Whole Foods, and some specialty stores. Check their website for locations. R & J Toffees received 2 Bronze Judges Awards at the Salon, plus a Gold and a Bronze in the People’s Choice Awards. What does the outdoors taste like? While not a local chocolatier, I had to give a nod to La Chatelaine Chocolat Co. for most unusual flavor at the Salon. The Montana-based chocolatier brought their Into The Forest truffle, described as a dark chocolate flavored with Douglas fir, topped with red pepper corn and a goji berry. While I feared it might taste reminiscent of those pine-shaped air fresheners, I didn’t really get the pine flavor as much as the goji berry taste, which to me is a weird, medicinal flavor. But it was definitely buzzed about at the show and got the notice of the judges: La Chatelaine Chocolat Co. received a Gold, 4 Silvers and a Bronze Judges Awards at the Salon, plus 3 Bronze People’s Choice Awards. New at the Salon this year was an acknowledgement awards ceremony for some of the hardest working artisans in the business: the women! Too bad some of those honored were out of town and couldn’t attend. Luckily, we had David Whittingham of Fera’wyn’s Artisan Chocolates to accept awards for the trio in Ashland. He even let his hair down while accepting the awards, but stopped short of standing in for the official photo. 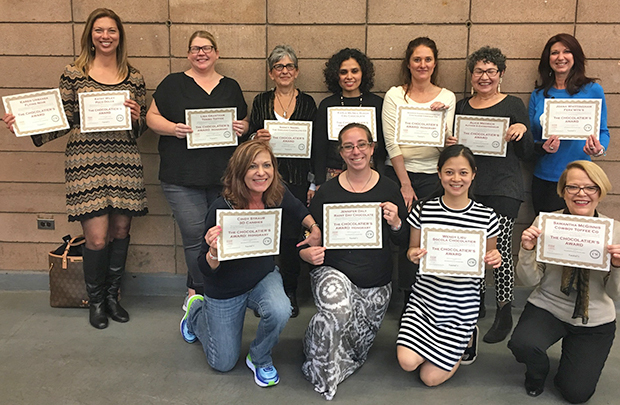 Instead, those of us passing out awards to the San Francisco Women in Chocolate helped out by posing with our MIA awardees’ certificates. Samantha McGinnis, Cowboy Toffee Co.
Shannon Hughes Grochowski, La Chatelaine Chocolat Co. Date posted: May 1, 2018. This entry was posted in East Bay chocolate, Events, Featured, Front page, Listed chocolatier, Local chocolate, North Bay, San Francisco chocolate and tagged Alice Medrich, Basel B Inc., Cacoco, Chocolate Salon, CocoTutti, Cowboy Toffee Company, Endorfin Foods, Fera'wyn's Artisan Chocolates, International Chocolate Salon, Kindred Cooks, Michael's Chocolates, R & J Toffees, Rainy Day Chocolate, Raphio Chocolate, Socola Chocolatier, Sweet55, Tombo Toffee, Z. Cioccilato. Bookmark the permalink.